Tony has spent the best part of his life sleeping in tents, snow shelters, on mountain tops or beneath the stars. He spent 11 years in the Scouting movement and was honoured with its highest awards by the Governor General of Canada. The year he turned 18, he planned a 26-day solo expedition to the desert canyons of the American South-West. Looking back, he acknowledges it as being a very pivotal transformative journey in his own development; the kind of experience that seems to be so absent for youth in the world today and the kind he has endeavored to create for others in his career ever since. Tony spent six years leading groups of Canadian volunteers as they facilitated play therapy programs for refugee children and their communities during the war in Bosnia. He spent another 6 years working with young offender youth through powerful wilderness therapy programs. In 2001, he was commissioned by the Ministry of Justice in Latvia to design a similar program for youth in custody there. He was awarded the Second Degree Service Medal and the Colours of Latvia for his work on those projects abroad. Most recently, Tony spent 5 years at Outward Bound Canada, where he served as the Director of Innovation and Program Development for their Community Programs. In this role he liaised with Aboriginal communities in eastern James Bay and the Territories to design expeditionary programs for their youth, supervised Asset Building expeditions for at-risk youth and served as their Instructor Trainer. Tony has spent time honing his skills in the wilderness, war zones, lecture halls, classrooms and boardrooms. He is a deeply experienced Instructor and Trainer as well as being an engaging public speaker, workshop presenter and storyteller. As well as being the CEO here at Leaders of the Day, Tony is currently the Board Chair for the Canadian Adventure Therapy Advisory Committee and is a frequent Guest Lecturer at many Canadian Colleges and Universities. He lives with his wife, their two little boys and their canoe tripping husky in the rolling hills of the Almaguin Highlands. After the experience of his very first canoe trip to Algonquin Park, Terry was captivated by the natural world and has never looked back since. For the last 25 years Terry has dedicated himself to sharing his passion and knowledge for wilderness pursuits and leadership training. In addition to using the wilderness as an innovative classroom, Terry holds degrees and teaching certifications in History and Geography and a diploma in Recreation Leadership. Prior to entering the Bachelor of Education program at Nipissing University he was the owner/ operator of an outdoor adventure company in Ottawa that specialized in leadership training and customized canoe, kayak and backpacking expeditions all over Canada. 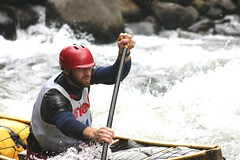 He has multiple ORCKA certifications and is a talented Paddle Canada instructor in a number of disciplines. Terry currently teaches high school in North Bay where he founded an innovative outdoor leadership and environmental studies program. This integrated program supports students in developing essential wilderness and provides rare opportunities for them to practice leadership and judgment. The program has a strong focus on environmental ethics, personal development and spiritual growth. The SOLE program partners with Leaders of the Day on many expedition initiatives and is among the most innovative programs in the province, combining traditional academic studies, high-level wilderness skills, leadership training, community-building, and the opportunity for students to daily challenge their own perceived limitations. For the past decade Scott’s studies, employment and volunteer work have focused on outdoor and experiential education. In addition to holding various industry standard certifications, Scott has also graduated from a college Outdoor Recreation program and earned degrees in Environmental Studies and Education. Scott’s previous work includes six years as an Instructor and Course Coordinator with Outward Bound in Canada and in Australia, as well as extensive time teaching at outdoor education centres. Scott has taught high school in Nunavut, worked as a community educator with street children in Uganda, and led wilderness trips throughout Canada by canoe, sea kayak, dog team, and on foot. Scott has seen first hand – as a learner and as a leader – the powerful, transformative potential of outdoor and expeditionary learning experiences. Whether working with youth, educators, adults or community groups, Scott is passionate about facilitating experiences that foster environmental connections and support individuals on their path towards personal excellence. Dana spent the better part of her childhood living on the edge of an ever-growing suburban sprawl; the distinct line between a rural natural landscape and concrete jungle almost a stone’s throw from her home. When left with the choice of which direction to go, there was only ever one option in her mind: into the forest. This draw to the wilderness would stick with her, eventually leading her to pursue a degree in Environmental Sciences from Trent University. Since graduating, Dana has definitely taken the “road less traveled” and has opted for boundless exploration rather than settling down. Beginning with several backpacking trips across Europe, she opened her eyes and mind to the vastness of the human population in the world, and the incredible beauty of its diversity. Upon returning home, she found meaningful work teaching for several different companies, all nurturing even further her love for this land, and the cultures that shaped it. Through these experiences, and her own constant drive to learn, she became deeply proficient in traditional survival and living skills and began to feel much more at home in a forest than anywhere else. Learning traditional ways of tanning animal skins for clothing, mastering the bow-drill and knapping flint arrow heads are just some of her many talents. These days you can find her still traveling, still teaching, and still exploring every part of the natural world that she possibly can. Last year, backpacking in Arizona and across the Pelly Mountains in the Yukon Territory; this year, immersing herself in Northern culture and traditions while bringing school programs to remote Native communities. Water and wilderness have been a part of Dave’s life since he was a child. Growing up he spent many summers sailing and swimming on the St. Lawrence River and exploring the lakes of Algonquin Park with family and friends. Dave’s passion for the outdoors lead him to the Gould Lake Outdoor Centre where he was both a student and then a staff member facilitating curriculum-based credit programs for students through a wilderness expedition medium. Dave also spent 4 summers working at Camp Opemikon directing their wilderness canoe tripping program. Dave then committed to Outdoor Education as his career path and began working for Outward Bound, where he was able to combine his wilderness and leadership skills to deliver experiential programs for diverse student populations. As an active whitewater paddler, Dave has explored many beautiful rivers and waterways in Costa Rica, Mexico, USA and across Canada. 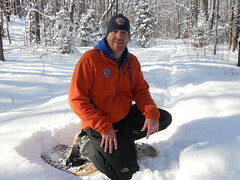 Dave is an Advanced Canoe Tripping Instructor and Advanced Moving Water Instructor Trainer through Paddle Canada. Dave believes that whether on a river or in a remote wilderness setting that people’s opportunity for growth is limitless when they open themselves fully to that experience. Dave thrives on helping his students grab hold of that that experience and to take the very most from it. When not on the water Dave works full time for Challenges Unlimited managing the installation of Challenge Courses and Zip Lines across Canada. Jonathan’s passion for the outdoors began early in his childhood. Growing up on the edge of an urban ravine provided endless hours of exploring the incredible flora and fauna that surrounded his own backyard. Through annual family camping trips, and periodic visits overseas to reconnect with family in Scotland and Ireland, Jonathan further developed his love for the countryside; both through fishing for trout and salmon and strolling through green fields hunting rabbit. After being hired as the Camp Director of the Vaughan Recreation and Culture Department, Jonathan set his feet upon a road of working with children and youth, a road that has continued to unfold for over a decade. Jonathan attended the University of Waterloo for Recreation and Leisure Studies with a Business Option that kindled a keen interest in business and particularly marketing. While at school Jonathan became involved with young people in his community and served as a Youth Outreach Worker in a positive engagement program for youth. Jonathan’s love of the outdoors won out initially though and led to him to pursue work as a Wilderness Instructor with the Outward Bound School in Baltimore, Maryland. After some remarkable experiences in the field, Jonathan traveled back up north and eventually made his way home again. Not long afterwards, he was hired on as part of the Instructional Team at Outward Bound Canada. In 2004, Jonathan was seconded for an assignment overseas working for Outward Bound Thailand. While there, he worked and trained, alongside his Thai colleagues, developing skills in jungle trekking and sea kayaking on the Gulf of Thailand. During his career with Outward Bound internationally, Jonathan has held several key roles: as an Instructor, Course Director, Staff Trainer and most recently as the Director of Innovation and Program Development for Open Enrollment Programs at Outward Bound Canada. 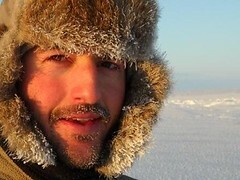 Jonathan retired from Leaders of the Day in 2012 to pursue his love of Arctic Exploration and now lives in Toronto, Ontario.